Compared to a decade back, nowadays you can easily create your website in hours. There are plenty of platforms available in the internet offering huge variety of free website builder tools. But the success of your site depends on the correct platform you choose. On other hand, paid hosting platforms like WordPress needs investment of lots of time and money. This is can’t be affordable for all site owners. So the most suitable solution for building a smaller scale site is to go with the free hosting website builder tools like Weebly or Wix. Here we have reviewed some of the easy to use sites based on the features and quality of free services. Building a website is very simple with Weebly’s drag & drop website builder. It is easy to create a powerful, professional website without any technical skills required. Over 40 million people and small businesses have joined Weebly to build their online presence. Text, photos, maps, and videos are added to your website by simply dragging & dropping them into place. Text is edited just like in a word processor and you can add slideshow, photo gallery, buttons and many other elements to your site. Building your website is done in real time, right from within your web browser. There’s absolutely nothing to install and worry about. A real WYSIWYG drag and drop website builder. Powerful and free shared hosting service. E-commerce features to build your online web store. Automatic responsive mobile site and free XML Sitemap for your site. Password protection for site and individual page level. Full HTML/CSS control allows you to customize everything on your site. Limited blogging features can’t compete with WordPress or Blogger. Most useful features are available only for paid members. 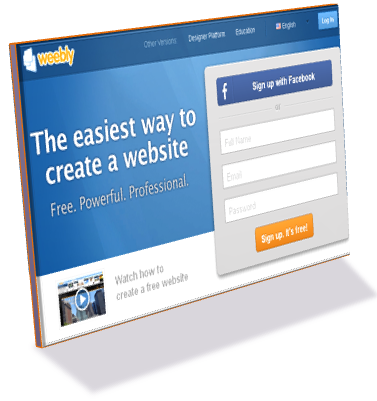 Weebly’s free site shows a footer note “Create a free website” (Learn how to remove Weebly footer) and your site will be hosted within Weebly domain (http://www.<yoursitename>.weebly.com). Blog is a wonderful feature allows you to post your articles and group them into categories. You can add RSS feed to your blog and make it easy for your site visitors to subscribe to your latest content. Weebly creates automatic mobile version support for your site and automatic sitemap for search engine submission. Sitemap of your Weebly site will be “http://www.<yoursitename>.weebly.com/sitemap.xml”. You can also add a Favicon to your free Weebly site, learn how to add favicon to your free Weebly site. 100 million plus – that is the count Wix shows the number of sites created with Wix site builder. 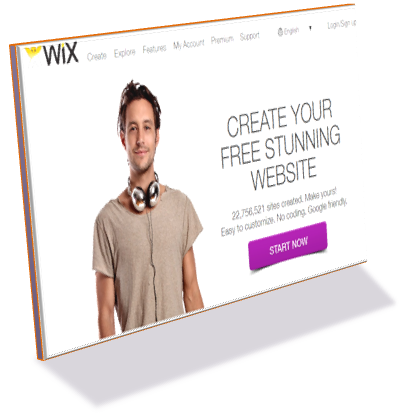 Wix app market offers many apps which can be added in your site like form builder, commenting and online shopping tools. 100+ designer made HTML5 templates. One page sites to make your online presence quickly. Sites are Google friendly and look stunning. 1000+ free stock images, clip arts and icons to use in your site. Advanced built in image editor for image optimization. Change colors, text, backgrounds, picture and more to create your own unique site. Create websites, mobile sites, Facebook pages & blogs with ease. Wix sites load very slow in the browser. 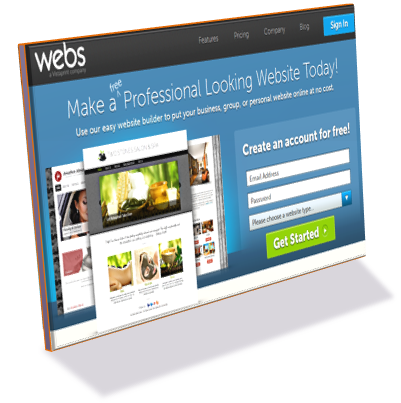 Webs also offers similar kind of drag & drop website builder tool like Weebly with over 300 templates to choose. Webs offers to create your own customized Facebook page in minutes. Webs does not provide AdSense element as such, still you can place your Ad codes in the custom HTML element. Free Facebook fan page for your site. Easy setup of online web store to sell your products. Option to build free forum and blog. Add social icons of Facebook, Twitter, LinkedIn, YouTube and many other sites. Mobile version for your website. Site enhancement with powerful apps. Built in functions like calender, video galleries and mailing list. Password protection and site membership options. Simple marketing tools will help in your site promotion. Most features are available only for paid members. In addition to free website creation tools with huge design options, HubPages offers variety of earning programs to integrate into your site including Google AdSense. This helps you to earn from multiple sources from a single site. High Traffic ranking in the search engines. Possibility of high earnings from eBay, Amazon, AdSense and HubPages Ads. User interface is not interactive, after looking into a site like Weebly you will never like to have HubPages. Every page is called as Hub and creating a consolidate Site is not possible as we understand. Too much focus on what the publishers should do, rather than what HubPages offers to the publishers. Hubs will be taken down at any point of time quoting the content quality. Hub name contains your account name in URLs like http://yourname.hubpages.com/hub/yourpagename – if you are not interested in revealing your name in the URL, then HubPages is not for you. Yola offers similar features like Weebly with the easy to use site builder for unlimited pages without any third party ads. You can easily build a professional websites in matter of minutes and publish it online. Drag and drop widgets, moderate user interface. Attractive full page layouts with flexible and customizable options. Easy to organize pages along with password protection. Built in business apps like mailing list, appointment scheduling and contact form. Free account does not have option to edit CSS/HTML of the site layout. You cannot modify the source code for example Site tracking is a Pro feature. Pro and Free features are not identified clearly, which leads to confusion. After you select tracking it will say it’s an Pro option. Webmaster Tools can not verifying Yola site easily which makes the Google search engine submission more difficult. WebStarts offers a free site builder tool with many integrated functions like adding a hit counter, payment enabled forms and Instagram feed. Customizable themes with hundreds of font selection. Built in apps like members only pages, menu builder and forms. 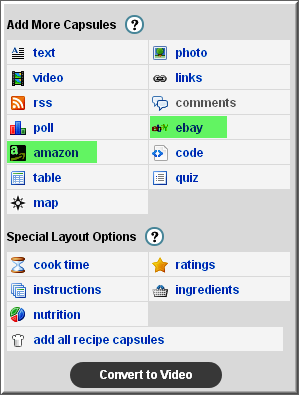 Hyperlinks rollover effect, page height adjustment and clip art features. Full access to source HTML to modify the look of your site. There are not much varieties of templates available, all templates available are looking pretty similar. Do not have a clear classification of free and pro features. When you drag a Forum you will be prompted to upgrade at the same time Blog is a free feature. Both options are under Apps menu which is much confusing. All free site builders offer shared hosting for free of cost. Shared hosting may cause your site blocked by any ISP due to improper usage. Learn more about Weebly login problems. Upgrading to pro package will cost approximately $8 per site on most of these free website builder tools and you will get better support as a premium user. There are new site builder tools popping up on daily basis. You also have options like Blogger, WordPress.com, Tumblr and many other platforms to start a free blog on the fly. Remember, these free platforms can only accommodate your site with restrictions. If you want to build a large and unrestricted site (in terms of hosting, backup and modifications) then we strongly recommend to go for paid hosting platforms like self-hosted WordPress platform. Though a good read but I wonder seeing TemplateToaster and Squarespace not on the list. A good website builder cannot be chosen if all the relevant options are not available to the users. To chose the best, you need to identify your prime requirements. Do not follow others. Choose wisely.